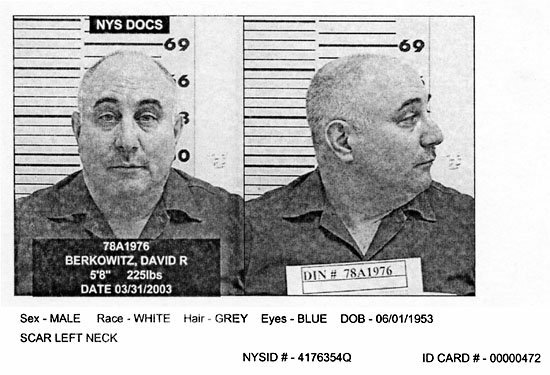 'Son of Sam' David Berkowitz posed for this New York State Department of Correctional Services mug shot in March 2003. The serial killer received six consecutive sentences of 25 years to life for a late-70s murder spree in New York City that left six people dead and seven others injured. Berkowitz, who claims he does not deserve parole, was denied it in 2002, the first time he had been eligible. He is currently incarcerated at the Sullivan Correctional Facility. Submitted by boofer6970 on Sun, 2011-05-15 16:26. Submitted by lisasmurf82 on Tue, 2011-03-29 15:11. Submitted by greglisi on Wed, 2011-03-23 19:05. He is proof that Jesus died on the cross, , even for him, a murderer. forgiving him and taking away his sin . Submitted by keilyn72 on Wed, 2010-11-03 10:18. Submitted by lisasmurf on Sat, 2010-10-09 19:08. Submitted by boofer6970 on Sun, 2010-08-22 21:36.